Baal Zebuth was belched from the depth of Hell in summer 1997 anno bastardi in the name of Grand Beelzebul and in autumn it had following staff: Sadist - hateful guitar, Sauron - disgusting grim voice, Amon - bass malice & Tormentor - hell drums. Next spring Kalmar - diabolical guitar from Black Metal band Defiance joined the horde. 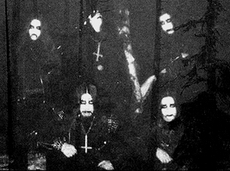 These staff of Baal Zebuth began to play gigs as mighty and majestic Black Metal band. The main themes of band's art are satanism, death, war, demonic possession and psychological chaos. Spring 1999 band started to record debut album "Unholy Baal Zebuth". After the record session crew discontinued working at the tape because of a number of negative causes (inner & outer) but despite this fact band played live as before. In 2002 the drummer was dismissed and his place took up GXfff. At the same time Kalmar commited a failure suicide by gun shot into his head and it slow down band's progress again. Only in 2003 Sadist resumed working at the album in S.H. studio. Baal Zebuth took part in two Stavropol Insanity compilations with four tracks from the prepared album (in future vocal and some guitar themes were re-recorded). In 2004 the long-waited release was out on Sauron's own label Macabre Prod. (limited to 500 copies). The delay with album issue helped Baal Zebuth easy to endure fashion on Black Metal while developing power in deep underground.